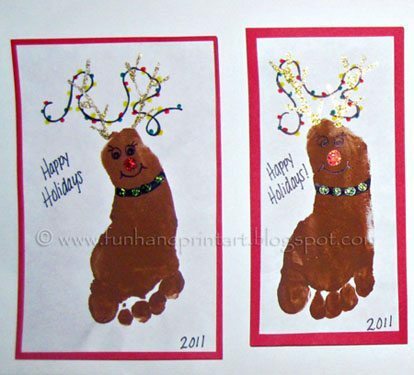 I made these Footprint Reindeer wearing Christmas lights with my daughter’s foot as some of our Christmas Cards to family. I put eyelashes on the eyes to make it look a little more on the girlie side. 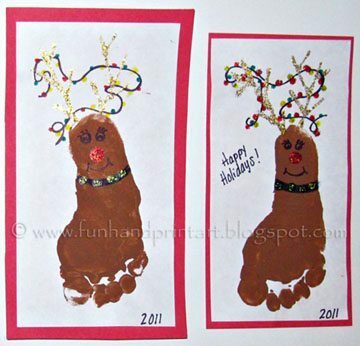 The antlers, red nose, and jingle bells on the collar are made using glitter glue. It would be cute to do the lights with the glitter glue and paint the antlers plain too! I am linking to these awesome parties! So cute Amanda! Merry Christmas to you and your family!